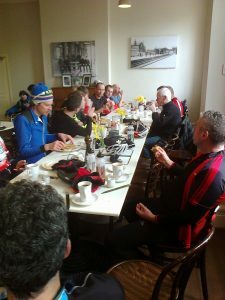 The first of several Warrington Road Club weekends planned for 2014 took place last weekend on the 8th and 9th of March. 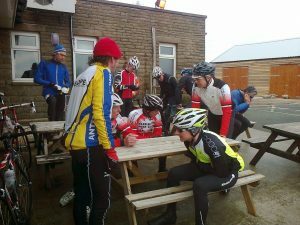 The trip, excellently organized by Carl Johnston, began with 21 riders leaving Horton Towers on Saturday morning. Peter Howl graciously drove all of our bags to the hostel. After lunch it was time to apply the normal cyclists navigational technique of “getting lost”. Dave Wright had a bit of paper – it may have been a map. Maybe. Eventually, those of us with Garmins decided to use them before it got dark. Aside from the tandem and one or two others who decided to stick with the “getting lost” technique and went off ahead. And got lost. Edwinstowe boasted three magnificent pubs one of which had an Elvis impersonator and another something called a “disco”. I think they had them in the 80’s. It was a little bit “you’ll never leave”. Everyone appeared to be still functional in the morning. Lunch was at Blaze farm which was… entertaining. First sunny day of the year, queue out of the door for ice-cream, kitchen in meltdown. So a leisurely lunch of around an hour and a half. Then home through the lanes being towed by the super-speed tandem. Next up – David’s Tour de France road trip!